Rich in tradition, customs and symbolism, an Indian wedding ceremony is typically a magnificently choreographed undertaking that lasts for up to five days or more. The rituals have evolved a great deal since traditional times and of course, differ greatly from Western ceremonies. Modern Indian weddings are as diverse as the many regions throughout the Indian continent and can involve all the rituals of traditional ceremonies, or can be tailored by the bride and groom and their families based on their own traditions and backgrounds. 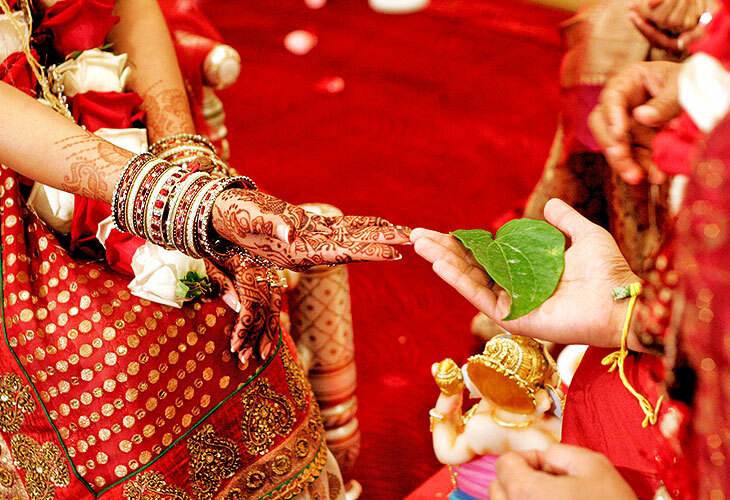 This article covers the most important components of a traditional Hindu wedding to help you begin your planning so you can make your own wedding an authentic and memorable affair! For more information follow these links for or more detail on Hindu and several other regional Indian wedding ceremonies including Bengali, Gujarati, Kashmiri and more. There are several important ceremonies that take place in the days before your wedding; the first is Misri – the ring ceremony. This will take place several days before your wedding and calls for seven married women to draw the sign of Lord Ganesha in red powder spread above a bowl of rock sugar. Prayers are said by you and your fiancée and your parents and you will exchange flowered garlands and gold rings with your beloved in the presence of your priest. The groom’s parents will place in your lap a basket of fruit or other gifts to welcome you then feed your family misri – rock sugar – confirming the engagement and promising a life full of sweetness ahead. 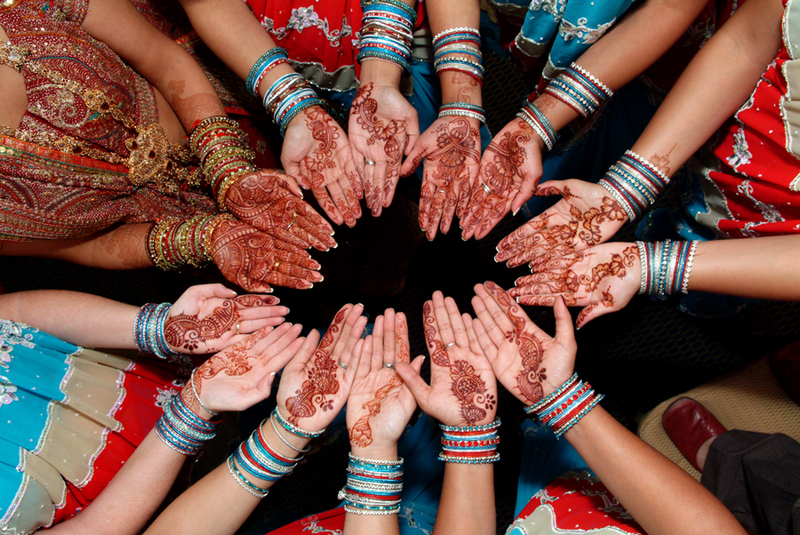 The next ceremony, Mehendi, takes place the day before the wedding at a ladies-only afternoon tea. 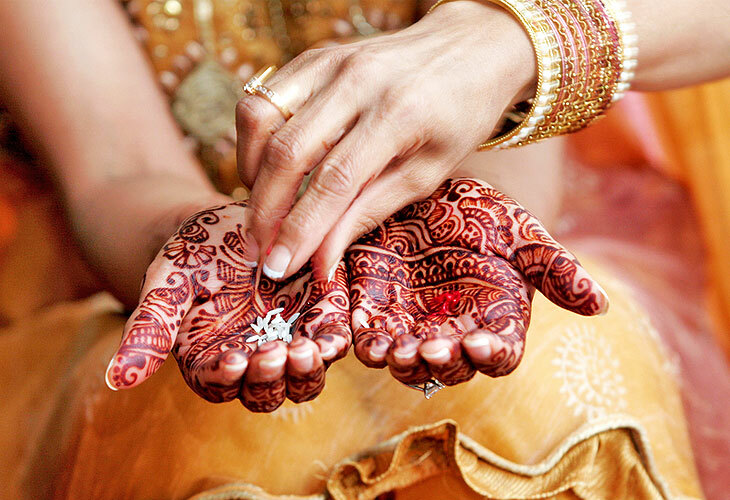 Intricate patterns drawn with mehendi (henna) are applied to your hands and feet and symbolize the deepening of bonds with your future husband. Often this ceremony will merge with Sagri – also known as the “acquaintance party”, where the groom’s female relations visit bearing gifts and flowers with which to adorn you. At some point on the day before your wedding, your priest will perform the Nav-Graha Puja in both the groom and bride’s homes, in which he will say prayers to the Gods of the “nine planets”, thus bestowing the couple with their blessings. Next he will perform the Ghari Puja – a series of prayers combined with offerings of wheat, coconut, betel nuts, rice and spices for prosperity. Both mothers will don their wedding clothes and walk to the doorways of their respective homes with earthenware pots containing water on their heads – the water will be cut with a knife to ward off evil spirits, and relatives and friends will then adorn the parents with flowers and money. Next, it’s time for you and your fiancée to put on old clothes which will be torn of with glee by family members, symbolizing the end of your single lives! The fun is just getting started as you begin the next ceremony called Sangeet. This is a joyous nighttime party held the evening before the wedding and is an opportunity to enjoy the spirit of the moment with music, dancing and food. Just make sure you get some sleep – you have a big day tomorrow! The day begins with the Haldi ritual, in which you are cleansed at your home with turmeric powder. This is followed by the Swagatam ceremony, in which your female relatives help you dress in your wedding sari. Your fiancée will also do the Haldi ritual and will be dressed in his wedding attire at his home before coming to your residence. When he arrives, at the threshold he’ll place his right foot gently over yours to symbolize the support and protection he will provide and will then be invited inside for his feet to be washed in milk and water (if the ceremony is being held at your home) or you will then depart to the location where your wedding is to be held. In traditional times you would have ridden in an ornately decorated horse-drawn carriage – but don’t worry, a limo is a perfectly acceptable mode of transportation and your priest will probably place a coconut under the tire before you depart, a symbol of the road-worthiness of your mode of transport! At the temple or the grounds where you’ve chosen to have your wedding, the ceremony will take place under a Mandap, the symbolic four-pillared canopy that is typically decorated with bright and vibrant colors under which burns Agni, the sacred fire that is witness to the ceremony. The ceremony begins with Madhuparka as your fiancée receives gifts from your father. Mantras are chanted during Kanya Daan as your father presents you to your fiancée and he takes your left hand in his right in Pani Grahan as he accepts you as his wife. 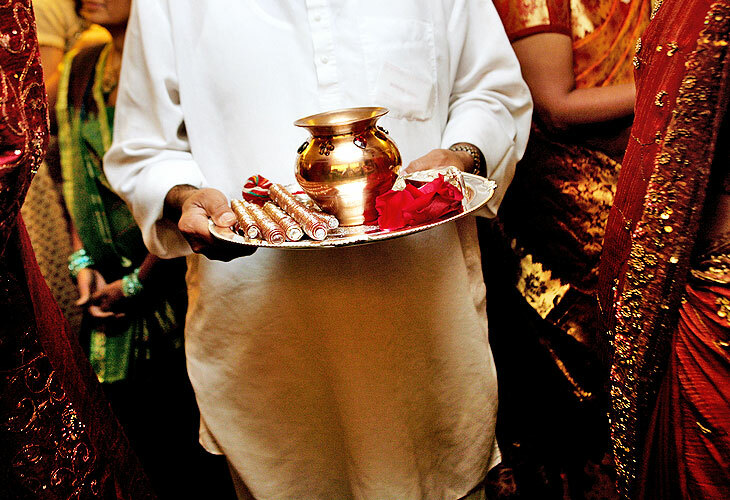 The next ceremonial functions include Pratigna Karan, Shila Arohan and Laja Horma – in which you drop an offering of puffed rice over the sacred fire – and Lawan Phere, which legalizes your union as you walk around the sacred fire four times, touching a stone on each turn which represents your ability to overcome the obstacles you will face ahead. 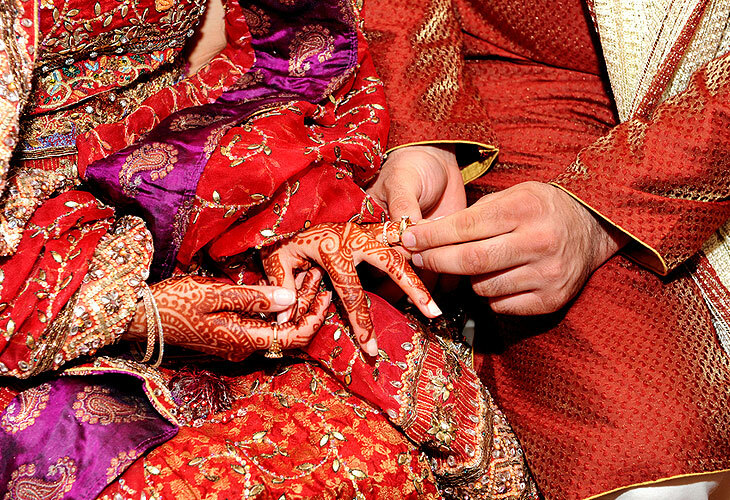 This is followed by the Saptapadi or seven steps ceremony, which involves a ceremonial knot to be tied between your sari and your husband’s scarf, and a thread that has been blessed that will tie your right hands together. You will turn to the north and take seven steps as you recite seven mantras that symbolize: the abundance of food and a life that is noble and respectful; physical and mental strength; spiritual strength and blessings; happiness; the welfare of all living things and noble offspring; bountiful seasons and togetherness; and a life of understanding, loyalty unity and companionship as well for the peace of the universe. There are a few more post-nuptial rituals and traditions that you and your family may chose to add after Saptapadi, and there are many additional rituals that typically carry on for a few days afterwards – the choice is up to you! An Indian wedding provides a rich tapestry of color and vibrant images that lend themselves to create striking wedding photographs. You’ll want to make sure your photographer captures close-up images of rituals like the Mehendi ceremony and the intricate patterns drawn with henna on your hands and feet. Pose for pensive portraits the morning of the wedding as you’re getting ready for the arrival of the groom, and make sure to let your photographer know ahead of time if there are any specific rituals you want him or her to pay special attention to. At the location of your wedding the elaborately decorated Mandap provides a stunning prop in which you will have many pictures taken. Simply relax and be in the moment – and let your photographer take care of the rest. Bold colors such as red, burgundy, orange and gold are typical of Indian weddings – and even your sari will be bright and vibrant – so different from traditional Western white wedding gowns! Marigolds, jasmine, roses and other brightly colored flowers are used in Indian wedding flower arrangements, all of which will combine perfectly to make your Indian wedding a beautiful and visually stunning affair.